Look, without going too much in the statistics of it, it is wrong to average P95 and P5 to obtain the mean. USGS is probably using Maximum Entropy methods to arrive at the probabilistic assessments they make, and these probability distributions are not necessarily symmetric. I sincerely doubt that they are averaging CDFs or HPDs (Cummulative Density Functions or High Posterior Density regions), to arrive at the P50. The same methods are capable of directly "delivering" the P50, and thus there is no need to average P5 and P95. and the corresponding references, to get an idea of the methods the industry applied in geophysical prospecting in the 60s and even get a glimpse of their mathematical basis). Going back to these numbers, the P95 estimate is in step with the actual production curve which to me is empirical evidence of the validity of these methods. By their very nature, probabilistic methods do not "return" a single number but a probability density function i.e. a function. In order to summarize these functions, one may either graph them or report percentiles (which the USGS does). If one wants to use these functions in decision making (which is our case by the way), then it gets more complicated: without going deep into the specifics of decision theory, one could "select" the URR which corresponds to a predetermined P level which is relevant to the question being asked. Since many things are at stake here, caution is warranted and the value with the higher probability (i.e. P95) should be used in the decision making process. People discredit USGS methods for reporting the "mean", when they should be paying closer attention to the meaning of these numbers and use the one more relevant to their decision making process. Eye balling the graph it seems that the P95 is dead right, and Campbell is dead wrong ... so if anyone has access to these numbers, could they please post the graphs on the web? I apologise for the pedantic tone, but these stuff are basic and they are covered in college level math courses, so I expect people who write about the end of oil and advocate the "instantaneous nuclear elimination of population centers" after the oil peaks (Stanton piece in the ASPO newsletter) to get up to speed with the probabilistic methods. What are you trying to say here JD? I thought you and this site fully expected oil to peak within a decade, you just don't think it's effects would be as serious as some people make out. The USGS mean figure for remaining oil has been used by the IEA to justify a peak oil year of no sooner than 2030, therefore the USGS are supporting such a date. If the USGS thought the IEA had misinterpreted their data they would be sure to tell them. I think anyone backing a peak oil date of no sooner than 2030 deservers to be discredited. The methodology of the USGS is key ... if the P95 curve that appears in the post of JD's is correct, it would mean that USGS have outperformed anyone else in predicting the future of oil discovery. Given the data that entered the calculation, the oil discovery will follow the P95/5/P50 curves with a probability equal to 95%/5%/50%. Yeah, the P95 curve lead to 1bn barrels left and an early peak, the P50 curve leads to over 2bn barrels left and a >2030 peak. The problem here is that governments, the IEA etc use the P50 and a >2030 date for peak (after decades of continued growth). 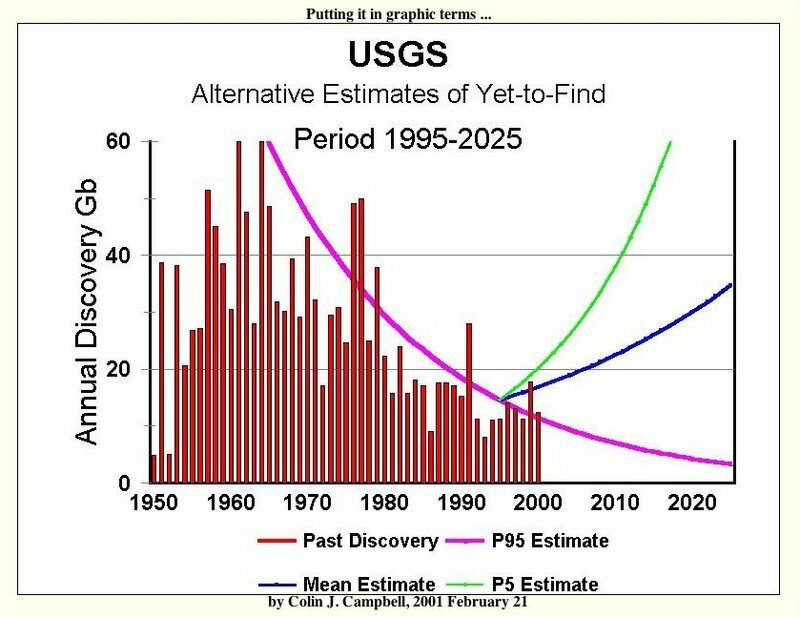 The USGS seem perfectly happy to be associated with a 2030 peak - that's why they should be discredited since it should be clear to everyone here that oil will peak within the next decade. Thanks for understanding the point chris. I have been dismissing the USGS till I decided to look more closely into their methodology, a task aided by JD's posts about it. I really do not know if someone screwed with statistics in the IEA or decided to use a cutoff that coincided with a preconceived view/message. This is quite an irresponsible behaviour if you ask me: when the consequences of a wrong prediction are dear, one should be more conservative in one's assessments and use a higher confidence level (or posterior probability cutoff) in one's predictions. But at least USGS is vindicated .... their methodologies seem to predict reality and put a probability (uncertainty) tag to their predictions. Yet someone somewhere decided to use a less certain prediction to deliver a message. 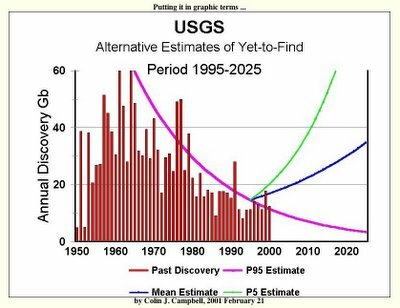 Now could someone plug the extrapolated P95 discovery curve to Rembradt's spreadsheets? If for example a non-crude source of readily available liquid fuel (such as coal liquification) came online tommorow would these models still hold true or would it be counted as demand destruction credited to another source (non-crude)? Good point freak. The Campbell graph of discovery (the red bars) does not include the contribution from non-conventional oil. It doesn't include deep water oil, tar sands, or GTL, or coal liquefaction, or ethanol, or biodiesel etc., and that is a major error. From what I understand as well the Slight energy positive nature of corn ethanol is not pressingly relevant as corn ethanol is a way of recover energy lost to unneccesary crops or unnecessary parts of the plant, and from what I understand corn ethanol has been use to replace a couple percent of gasoline consumption which is significant compared with letting it go to waste. So these things don't even figure into the peak calculations? Chris, I assume you mean 1 trillion (for P95) and 2 trillion (for P50). With 2 trillion barrels left, that would put peak sometime before 2020, not 2030, since we'd only need to use up another half trillion to reach the halfway point. With increasing demand, that's probably around 2015, if we're lucky.